Aaron Gillespie is a pretty impressive individual. He has been drumming for the band Underoath since he was fourteen years old, and remains the only member of the band to be featured on every recording. In 2006, he recorded nearly all the instruments for "Southern Weather", the debut album for his side project, The Almost. Many compare Aaron to Dave Grohl, because of the drummer-turned-frontman career path. But Gillespie's achievements to date, nevermind what he will achieve in the future, are on a much different scale. 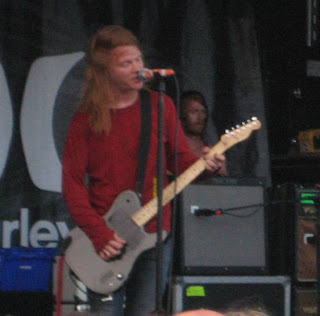 As a member of Underoath, Gillespie began singing harmonic vocals on 2004's "They're Only Chasing Safety." This was the first album I heard of theirs, and I remember saying they needed to take a lesson in Screamo. I couldn't stand the way it seemed like every lyric was screamed, because I really prefer to hear the growling and screaming in bridges and choruses. Well, I need to get used to it because Underoath isn't Screamo. They've been referred to most often as Deathcore, or Metalcore. And as abrasive and messy as deathcore can sound, Underoath has steadily and handily delivered a cleaner, more precise sound while staying true to their roots all these years. "Safety", the band's fourth album, was written after the breakup of a very serious relationship for Gillespie, referring to it as if he had ruined someone's life. He felt like he couldn't move on and get married before releasing these feelings, so the album was a matter of great importance to him. From the followup album, "Define the Great Line", the video for "You're Ever So Inviting" won one of MTV's Battle of the Videos in 2007. "Define" was written from the band's core, was a favorite of all members, and was going to be a very hard act to follow. On September 2, 2008, Underoath released "Lost in the Sound of Separation". They used two producers, three tracking rooms, four drumkits, and five amps over forty-two days of recording. Technically, it's a masterpiece. And individually, each member contributes an amazing amount of talent to the sound. But I still go back to Aaron and the drums. It's a thing to behold. And I'm curious to know whether he will go back to using the deep kickdrums ("They look cool live, but they don't sound awesome"), rather than the 14- and 16-inch drums he was convinced to use for much of the record ("Cuz that's how they sound good!") , when the band goes on tour this fall with Saosin. Are you ready to give some Deathcore a try?